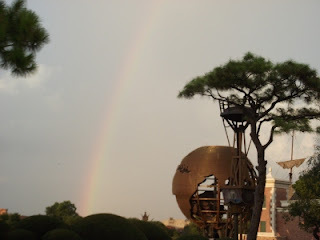 Les Chefs de France is one of the places where Hubby and I dined at Walt Disney World. It's in the France pavilion in the Epcot World Showcase. The décor inside is designed to represent a casual Parisian brasserie. There are huge windows along the full front of the restaurant. The atmosphere at Les Chefs de France reminded me of a small upscale steakhouse. Reservations are not required but they are needed. Even with reservations we had to wait about 20 minutes on a table. Like most of the table service restaurants at Walt Disney World the Les Chefs de France fills quickly. Book in advance to secure a table. Hubby and I were on the Disney Dining Plan where your food is prepaid. Our package included a snack, quick service meal and one table service each per day. This makes a Walt Disney World an attractive all-inclusive vacation. Like at Les Chefs de France, you can select from certain menu items at table service eateries. At this restaurant we were able to select from the Prix Fixe 3 courses menu. Frankly, I was disappointed with the selection that Les Chefs de France offered. Entree choices were Beef and Pasta, Roasted Chicken, Broiled Salmon or Baked Macaroni and Cheese. Each of these came with a starter and dessert as described in the link above.